A workhorse Stratocaster with subtle kick. Upgrades from American Standard spec; new pop-in vibrato arm and pickups. Some players just don't get humbuckers on Strats! As of 2017, the American Standards are dead. Long live the all-new American Professional series. But while the name is new, there's plenty here that's inherited from the Standard platform, such as the flattened 241mm (9.5-inch) fingerboard radius and the two-post vibratos. The Professionals - just like the Standards before them - are designed to appeal to a wide range of players with a wide range of styles. These are not for vintage obsessives. Most of the changes are relatively subtle: a new 'modern deep C' neck shape; new narrow/tall frets; and the Teles revert back to three (compensated) brass saddles over the previous six Strat- style saddles. And, oh yes, we've got new colours, too: Sonic Grey, Antique Olive and Mystic Seafoam join the ranks. The new Pro range introduces three new colours - Sonic Grey, Antique Olive and Mystic Seafoam - but your choice of body type (ash or alder) is limited; less so, the fi ngerboard material (maple or rosewood). 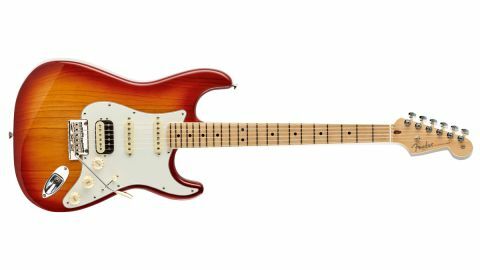 The Strat with ash body is only available in Sienna Sunburst; likewise the HSS - both have either maple or rosewood 'boards. It's alder-only on the HH, while the Tele, as you'd expect, has an ash body on Natural, Crimson Red (rosewood) and Natural 2-Colour Sunburst, Butterscotch Blonde and Mystic Seafoam (maple). The definition of the original modded Strat, the HSS takes the Pro Strat platform and adds a Shawbucker 1 at the bridge. It's a pretty classic vintage-spec, low-output humbucker using an Alnico 2 bar magnet, 42 gauge plain enamel wire and unpotted coils "to capture every nuance of your style", says Fender. Like the previous American Standard HSS Shawbucker, the Pro version is wired - in position 2 (bridge and middle) on the five-way selector switch - "so that the humbucker is full on; it doesn't drop one coil", explains Tim Shaw. as far as I'm concerned: using the 500K pot on position 2 opens up the sound of both pickups together. "There's [also] a different RC circuit for the humbucker side and the single-coil side," he adds, "so we've tailored the bleed for the different pickups it sees." The HSS has a less pushy character than the recently-released SSS, which sounds a little beefier in the lower mids with a little more separation, clarity and percussion. The HSS sounds a little more 'blurred', in a good way - very Fender. The maple neck, too, while marginally deeper, feels as if it has a squarer shoulder (much like the maple- 'board Tele) as well as a bigger radius to the rolled edges. The bridge/middle mix is a little muted, less stringy - again, in a good way - while the nicely balanced bridge humbucker smooths some of the spikier highs and nails a more classic rock voice into a crunchier gained Marshall-like amp channel. The first question is, are the Pros simply a rebranded Standard or an upgrade? For the everyman player, it's the latter. too, the Shawbucker models draw on plenty of classic character.